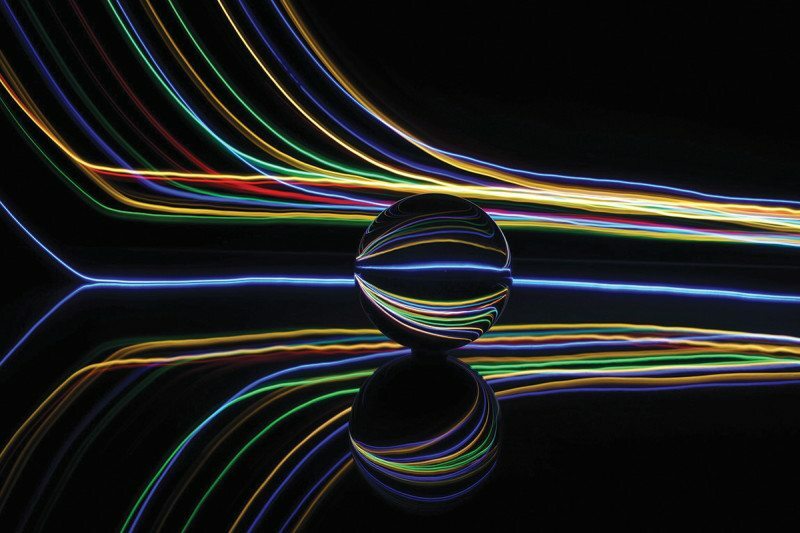 They will be the ultimate multitaskers – but quantum computers might take a bit of juggling to operate. Now, a team has simplified their inner workings. Computers that take advantage of quantum laws allowing particles to exist in multiple states at the same time promise to run millions of calculations at once. One of the candidate technologies involves ion traps, which hold and manipulate charged particles, called ions, to encode information. 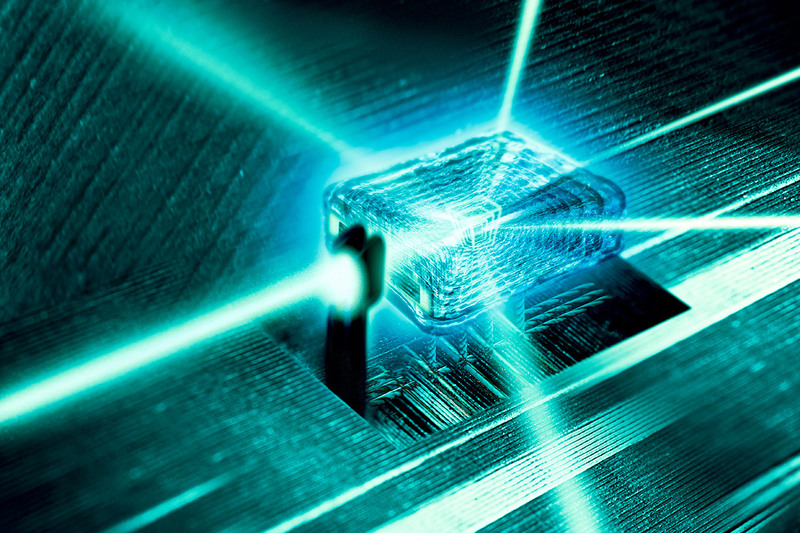 But to make a processor that works faster than a classical computer would require millions of such traps, each controlled with its own precisely aligned laser – making it extremely complicated. Now, Winfried Hensinger at the University of Sussex in the UK and his colleagues have replaced the millions of lasers with some static magnets and a handful of electromagnetic fields. “Our invention has led to a radical simplification of the engineering required, which means we are now able to construct a large-scale device,” he says. In their scheme, each ion is trapped by four permanent magnets, with a controllable voltage across the trap. The entire device is bathed in a set of tuned microwave and radio-frequency electromagnetic fields. Tweaking the voltage shifts the ions to a different position in the magnetic field, changing their state. The researchers have already used this idea to build and operate a quantum logic gate, a building block of a processor. This particular gate involves entangling two ions – in other words, linking their quantum states such that they are fully dependent on each other. Hensinger says this is the most difficult kind of logic gate to build. Manas Mukherjee at the National University of Singapore is impressed with the new technology. “It’s a promising development, with good potential for scaling up,” he says. That’s exactly what the team is planning: they hope to have a trial device containing tens of ions ready within four years. The fact that the device uses current technologies such as techniques for silicon-chip manufacturing means there are no known roadblocks to scaling up to create a useful quantum computer. It won’t be plain sailing, though. Scaling up will mean creating magnetic fields that vary in strength over relatively short distances. This a significant engineering challenge, says Mukherjee. Then there’s the challenge of handling waste heat, which becomes more problematic as the processor gets bigger. “As with any architecture, you need low heating rates,” he says. 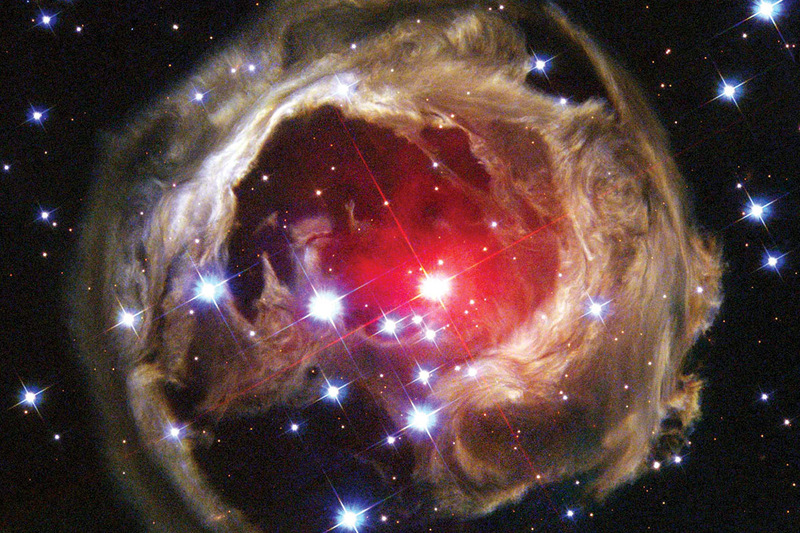 A dim binary star is behaving exactly as expected if it is about to explode as a “red nova“. If that happens, in 2022 or so it could shine as brightly as the North Star. Dozens of ordinary novae – the temporary flare-ups of white dwarf stars stealing gas from their companion star – explode in our galaxy every year. These novae turn blue. In recent years, however, astronomers have discovered a rare type of nova that turns red instead. At peak brightness, many red novae rival the most luminous stars in the galaxy. A red nova in 2008 gave us a clue as to why these explosions happen: observations made before the blast revealed that the nova was the result of two stars orbiting each other merging into one. The two stars were in a so-called contact binary, orbiting so closely that they touched. If Earth circled a contact binary, our suns would look like a fiery peanut. Despite their exotic appearance, contact binaries are common, with nearly 40,000 known in our galaxy. Now, new observations show that one, named KIC 9832227, could be about to explode as a red nova. “My colleagues like to call it the ‘Boom Star’,” says Larry Molnar of Calvin College in Grand Rapids, Michigan. The binary is roughly 1700 light years from Earth, in the constellation Cygnus. The two stars whirl around each other every 11 hours. In 2013 and 2014, Molnar’s team discovered two things about KIC 9832227 that suggest an imminent explosion: the orbital period is decreasing, and it’s doing so at an ever-faster rate. This is exactly what the contact binary that sparked the 2008 red nova did. The orbital period shrank because the two stars circled each other faster as they spiralled closer together. Unfortunately, other effects can mimic this decrease in orbital period. For example, a third star can pull the binary toward us so that its light takes less time to reach Earth, creating the illusion that the two stars are circling each other faster. So additional observations were needed to figure out what KIC 9832227 was likely to do. In late 2015, astronomers in Bulgaria observed the star with a 30-centimetre telescope, and found that its period is still shrinking at an ever-faster clip. “A stellar merger is a real possibility,” says Alexander Kurtenkov of the University of Sofia. Molnar’s team finds this trend persisting into 2016. “At this point, I think we have a serious candidate,” he says. His latest observations, made with 40-centimetre telescopes in Michigan and New Mexico, put the date of the potential explosion between 2021 and 2023. But he cautions that another three years of observations are required before he can rule out alternatives. By then, if the orbital period keeps shrinking faster and faster, an impending explosion will be very likely. If it calms down, there might be a different outcome. KIC 9832227 is currently 12th magnitude – visible only through a telescope. But if it brightens by 10 magnitudes, as the 2008 red nova did, it will be as bright as the North Star and the brightest stars of the Big Dipper, and easily visible to the naked eye. Face it, the vast darkness of space is a little eerie. It’s no wonder we usually prefer to focus on the bright spots. But it’s in the void that we might find our best explanations of the cosmos. In 1923, Edwin Hubble showed that the universe was far larger than expected by discovering that what we thought were swirls of gas on the edge of our own galaxy were actually galaxies in their own right: lonely “island universes” we could spot across an empty sea of black. That led to a comforting thought – we now know that even the darkest patch of sky, when seen through the telescope named after Hubble, is dotted with clumps of luminous stuff like our Milky Way. But there’s another view of the universe, like the horror cliché of flipping an image to its photonegative. Since 1981, when astronomers found a vacant expanse called the Boötes void, we’ve also known that the universe has holes of cold, dark, lonely nothing that are larger than anyone expected. To truly understand the universe, we may have to gaze into the abyss. 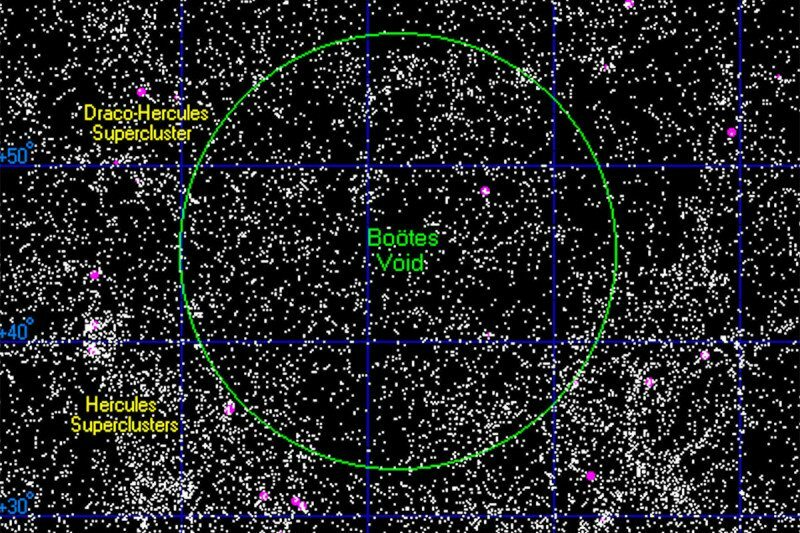 The Boötes void, which you will assuredly not see if you look at Boötes, the “ploughman” constellation adjacent to the Big Dipper, is a rough sphere about 280 million light years in diameter. Galaxy-wise, it’s a ghost town. When we first saw the void, we found only one galaxy inside. Since then, we’ve detected only a few dozen more. By contrast, the Virgo Supercluster, a smaller region that includes the Milky Way, contains over 2000 galaxies. As residents of the Milky Way, humans are able to see one large nearby galaxy, Andromeda, with our naked eyes. The proximity of Andromeda helped Edwin Hubble look at its individual stars to unlock the true scope of the universe. If our galaxy were in the Boötes void, our nearest peers would be much farther away – perhaps allowing us to fancy ourselves at the center of the cosmos for longer. This is no statistical accident. At very large scales, the universe is often described as a cosmic web, with strands of invisible dark matter undergirding the universe’s luminous structure. It might be better here to think of it as cosmic foam, like soap bubbles in a bathtub. Just as it’s sudsy where bubbles intersect, galaxy clusters concentrate in walls, filaments and intersections. In between is mostly void. The problem was that the Boötes void was just too big. Voids grow because their dense edges have a much stronger gravitational pull than anything at their centres. But the universe wasn’t yet old enough to have inflated such a big bubble. For an explanation, we had to wait until the 1998 discovery of dark energy: a cosmic pressure that forces empty regions of space to expand as if someone was blowing air into each of the universe’s soap bubbles all at once. Many astronomers, now in a boom of cataloging and mapping voids, think these spooky regions that expose the naked fabric of the universe could point to the next big discovery. Soon, statistical analyses of their shapes may be able to help us measure dark energy, gravity and any mysterious new forces better than ever before. And in the process, perhaps, they will help us learn to embrace the emptiness. Tags: Astronomy ( 7,548 ), Basic Research ( 10,441 ), New Scientist, Orion Spur ( 2 ), Where is the Milky Way? It’s tricky to map an entire galaxy when you live in one of its arms. But astronomers have made the clearest map yet of the Milky Way – and it turns out that the arm that hosts our solar system is even bigger than previously thought. The idea that the Milky Way is a spiral was first proposed more than 150 years ago, but we only started identifying its limbs in the 1950s. Details about the galaxy’s exact structure are still hotly debated, such as the number of arms, their length and the size of the bar of hot gas and dust that stretches across its middle. The star-filled arms are densely packed with gas and dust, where new stars are born. That dust can obscure stars we use to measure distances, complicating the mapping process. Two of the arms, called Perseus and Scutum-Centaurus, are larger and filled with more stars, while the Sagittarius and Outer arms have fewer stars but just as much gas. The solar system has been thought to lie in a structure called the Orion Spur, or Local Arm, which is smaller than the nearby Perseus Arm. Artist’s conception of the Milky Way galaxy as seen from far Galactic North (in Coma Berenices) by NASA/JPL-Caltech/R. Hurt annotated with arms (colour-coded according to Milky Way article) as well as distances from the Solar System and galactic longitude with corresponding constellation. Now, Ye Xu and colleagues from the Purple Mountain Observatory in Nanjing, China, say the Local Arm is just as grand as the others. 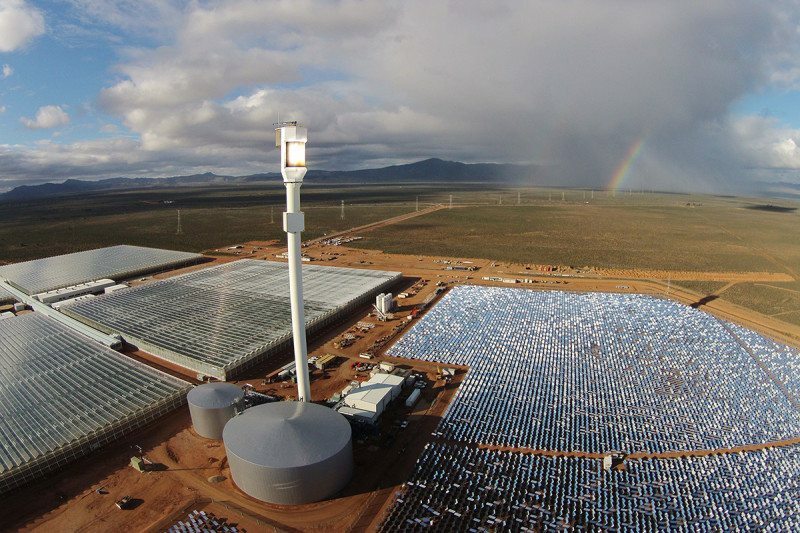 The team used the Very Long Baseline Array in New Mexico to make extremely accurate measurements of high-mass gas clouds in the arms, and used a star-measuring trigonometry trick called parallax to measure their distances. The new measurements suggest the Milky Way is not a grand design spiral with well-defined arms, but a spiral with many branches and subtle spurs. However, Xu and colleagues say the Orion Spur is not a spur at all, but more in line with the galaxy’s other spectacular arms. The team also discovered a spur connecting the Local and Sagittarius arms. “This lane has received little attention in the past because it does not correspond with any of the major spiral arm features of the inner galaxy,” the authors of the study write. Future measurements with other radio telescopes will shed more light on the galaxy’s shape. The European Space Agency’s Gaia spacecraft is in the midst of a mission to make a three-dimensional map of our galaxy, too. More measurements of the high-mass gas regions will help astronomers determine what our galaxy looks like, from the inside out. A star’s heat goes deep. 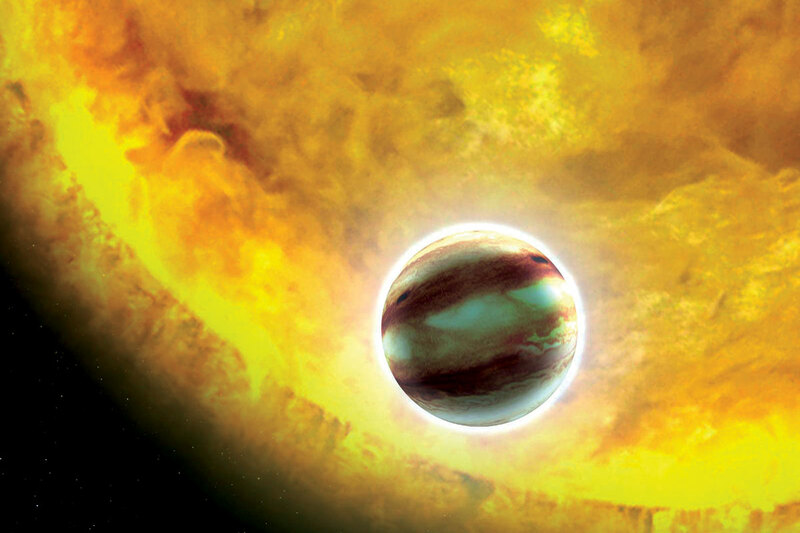 For the first time, we have spotted a “hot Jupiter” that has expanded thanks to its swelling host star – an observation that could settle a 15-year-old debate. HAT-P-1b, for example, contains half the mass of Jupiter yet is 20 per cent larger in radius. This gives it such a low density that it would float in a bathtub. For more than a decade, we have been trying to explain how these planetary puffballs grow so large. The dozen or so different scenarios we have come up with all fall into two broad categories: either the star’s heat keeps the planet from cooling and therefore contracting, or it somehow penetrates the planet’s deep interior, causing it to expand. One way to test this would be to nudge an older planet – one whose initial heat is long gone – towards its host star. If all that were needed for expansion was heat from the star, the planet would inflate like a balloon. But if planetary heat were also needed, then the nudged planet would remain the same size. We can’t play puppeteer with other planetary systems, but we can search for Jupiter-size planets orbiting red giant stars. These stars, which are in a later stage in their evolution, are bigger and brighter than when they were youngsters. That means a Jupiter-size planet orbiting a red giant is a good stand-in for a planet that has been pushed close to its host star. To search for such systems, Grunblatt and his colleagues examined data from the Kepler space telescope. They discovered that one planet, dubbed EPIC 211351816.01, is 1.3 times Jupiter’s size and far enough away from the red giant that it could only have inflated after the star had swelled outward. “We’re catching it in a phase where its radius is being expanded because the star’s brightness is increasing a lot, just in the past few hundred million years,” says Jonathan Fortney at the University of California, Santa Cruz. Adam Burrows at Princeton University says we can’t reach strong conclusions from studying just one object. But he says that another recent study shows that older planets, which orbit brighter stars, tend to be slightly larger than younger planets, which orbit fainter stars. Taken together, both studies strongly suggest that stellar radiation alone can inflate planets, he says. But we are still hunting for further examples. 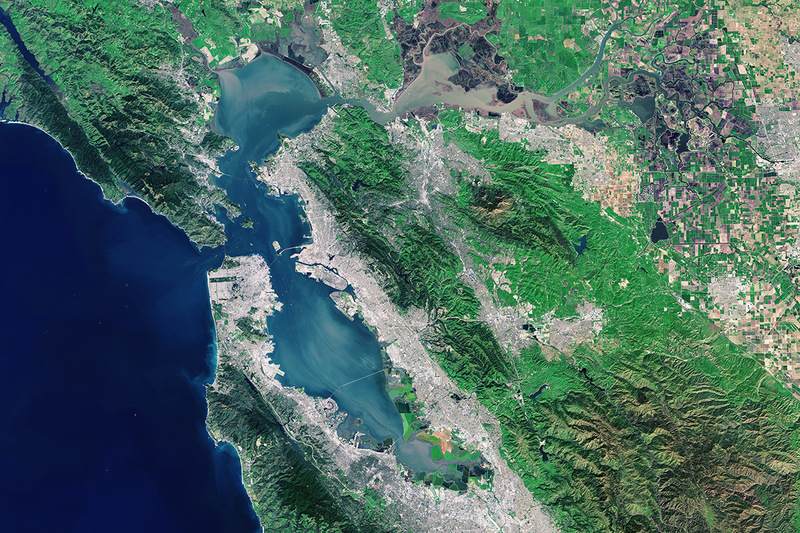 “The TESS mission, which will launch at the end of next year, should observe maybe 100,000 red giants and really help put this question to bed,” says Thomas Barclay at the NASA Ames Research Center. 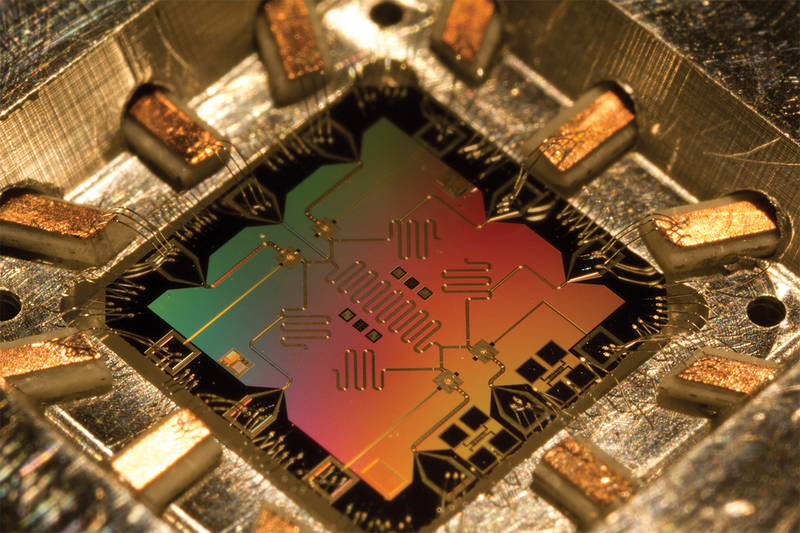 The field of quantum computing is undergoing a rapid shake-up, and engineers at Google have quietly set out a plan to dominate. 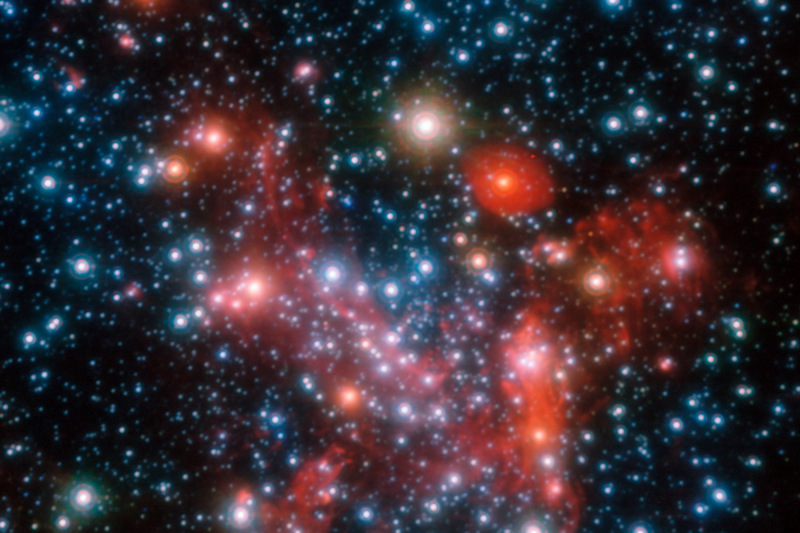 Part of our galaxy’s centre, as seen in near-infrared wavelengths. ESO/S. Gillessen et al. There’s a party in the galactic centre. We may have found the first solid evidence of a dense conference of stars around the Milky Way’s heart, which may one day help us observe the supermassive black hole living there. The structure is known as a stellar cusp, and it has played hide-and-seek with astronomers for more than a decade. It was first proposed in the 1970s, when models predicted that stars orbiting a supermassive black hole would jostle around every time one was devoured. Over the course of a galaxy’s lifetime, this should leave an arrangement with many stars near the black hole and exponentially fewer as you move farther away. But it has been hard to prove this happens. Other galaxies are too far away for us to see their centres as anything more than fuzzy blobs. Observations in the early 2000s seemed to support a cusp in the Milky Way, but better data showed that we had been tricked by obscuring dust. Now, Rainer Schödel at the Institute of Astrophysics of Andalusia in Granada, Spain, and his colleagues have combined images of the galactic centre to map faint old stars, which have been around long enough to settle into a cusp. They also studied the total light emitted by all stars at varying distances from our galaxy’s central black hole, and compared the results with simulations. These methods point to the same conclusion: the cusp exists. Around our galaxy’s central black hole, the density of stars is 10 million times that in our local area, says Schödel, who presented the work on 7 September at the LISA Symposium in Zurich, Switzerland. Many of those stars will eventually explode as supernovae, leaving behind black holes with masses comparable to that of our sun. If one of these merges with the black hole in the galactic centre, it will emit telltale gravitational waves that can be picked up by future observatories, like the proposed Laser Interferometer Space Antenna (LISA). Those waves will help figure out the mass, rotation rate and other properties of the black hole with extreme precision. “These stellar mass black holes would be absolutely perfect probes of spacetime around the supermassive black hole,” Schödel says. If the Milky Way has a cusp, then it’s likely that other galaxies do as well. That’s good news for an observatory like LISA, which may be able to pick up waves from dozens or even hundreds of interactions between stellar mass and supermassive black holes each year. The work is a significant advance over previous methods and seems to support the existence of a cusp, says Tuan Do at the University of California, Los Angeles. “The galactic centre is always surprising us though, so I think it would be great to take more observations to verify that there is a cusp of faint old stars,” he says. The next generation of enormous observatories, like the Thirty Meter Telescope and Giant Magellan Telescope, will see an order of magnitude more stars than current observatories can. They will almost certainly observe the cusp if it’s there, Schödel says.